"There was a movie in the 1980s called Seems Like Old Times starring Goldie Hawn and Chevy Chase. One of the recurring themes in this movie was Goldie Hawn's character's ability to cook an amazing dish called Chicken Pepperoni. I had never heard of Chicken Pepperoni before, but I thought it sounded delicious. So I decided to put some ingredients together and gave it the ol' college try. It came out delicious!" Rub oregano and basil over chicken breasts. Spray a large skillet with cooking spray and heat over medium-high heat. Add garlic; cook and stir until fragrant, 2 to 3 minutes. Add chicken; cook until browned and no longer pink in the center, about 5 minutes per side. Pour half the spaghetti sauce into a large baking dish. Lay chicken breasts on top. Coat chicken with remaining half of the spaghetti sauce. 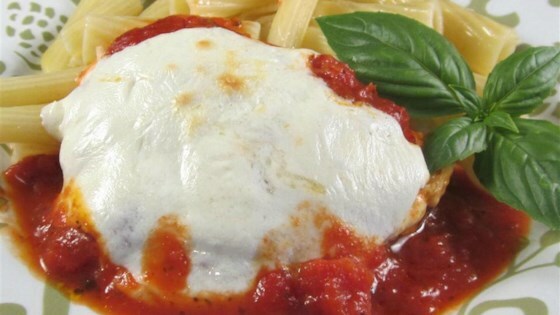 Scatter mozzarella cheese over sauce. Arrange 6 pepperoni slices over each chicken breast. Bake in the preheated oven until cheese is melted, about 10 minutes. Use any blend of Italian shredded cheeses instead of mozzarella if preferred. You can use regular pepperoni instead of turkey pepperoni, but it's a little greasier. We really liked this. EASY!